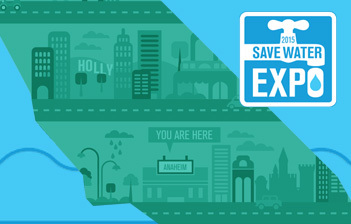 ANAHEIM, CA - (June 1, 2015) - Anaheim Public Utilities invites the community to learn more about saving water at the 2015 Save Water Expo. The event will be held on Saturday, June 6, from 10 a.m. to 2 p.m. at ARTIC, the new transportation hub located at 2626 E. Katella Ave., Anaheim, CA 92805 (across from Honda Center). The event will provide residents with an opportunity to receive an array of information from local and regional water conservation experts and partners including: Anaheim Home Depot, Armstrong Garden Centers of Anaheim, Anaheim Fire and Rescue, Anaheim Public Library-Books on the Go, Angels Baseball, Disneyland Resort, DNV GL Energy Services USA Inc., Ewing Irrigation and Landscaping, Five Star Turf, Fullerton Arboretum, Global Syn-Turf/Artificial Grass, Golden State Water Company, High Sierra Showerheads, Hunter Industries, Inside the Outdoors, Lowe’s of Anaheim, Municipal Water District of Orange County, Muzeo, Netafin Drip Irrigation, No More Geysers, Orange County Mosquito and Vector Control District, Orange County Water District, Orange County Coastkeeper, Resource Action Programs, SoCal Gas Company, Sustainable Sam, Toro/Irritrol Irrigation, Tree of Life Native Nursery, Turf Evolution, Urban Agriculture Community-based Research Experience, UC ANR Cooperative Extension - Orange County, WaterDex, Wheeler Company – Water Conservation Education, Wyland Foundation, Yorba Linda Water District, and the Cities of Anaheim, Brea, Orange, and Santa Ana.